I stopped eating pork many years ago, and I can’t even remember why. For the last six years, though, it’s because of my diet. Pork is on the “Avoid” list. My body has become very sensitive to pork, and reacts badly to it. Before I left for vacation in Spain, my friend, Mazie, and I were on the hunt in D.C. for a special Spanish jamon (ham) called Iberico de Bellota. On a tip, Mazie found Iberico de Bellota at Canales Deli in Eastern Market. It cost $67 for less than a half pound. I asked Mazie what was so great about this particular pork. She said the pigs are raised to forage on acorns, and the meat has an extraordinary taste. She insisted I try a piece of the precious ham. I agreed to taste just a sliver, and took a chance on the pig’s acorn diet. I ate the sliver and fully expected to suffer in short order. Expected to bloat. Didn’t happen. Expected severe stomach cramps. Didn’t happen. Expected to become violently ill. Didn’t happen. This is what I’ve learned about the pigs. 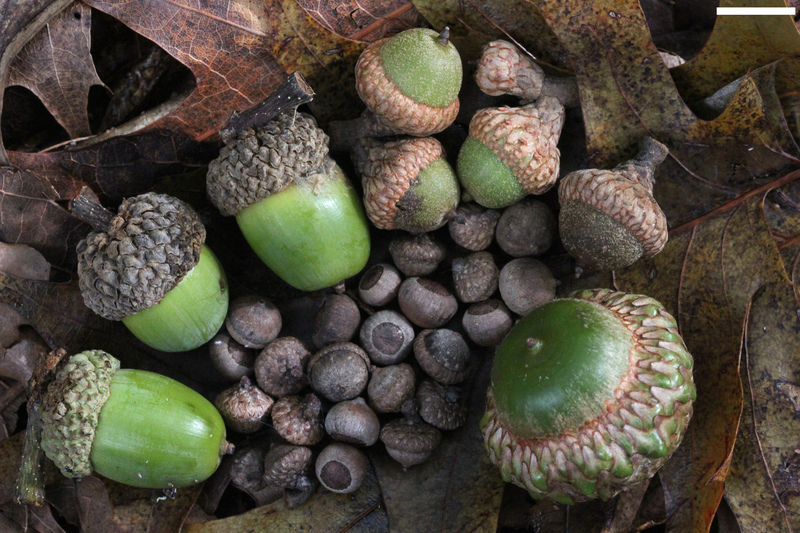 “Bellota” means acorn. These pigs are raised in a region of western Spain on pastures with oak tree groves. Certain pigs are selected to finish their lives foraging a pasture for herbs, wild mushrooms, and grasses, and, especially, acorns. The pigs are allowed to do what pigs naturally do — dig, roam, and forage for their food. They are considered “semi-wild,” and the Spanish government strictly regulates the Iberico de Bellota bloodline for quality and integrity. In contrast, pigs raised in crowded industrial livestock operations nose-to-tail with other pigs suffer. I’ve read that pigs raised in this unhealthy environment are so stressed they often eat each others’ tails. I’ve also read that these industrial operations often supply pork to U.S. supermarkets. Know this, if you find Iberico de Bellota cured ham in the U.S., it came from a very special, healthy and happy pig. Iberico de Bellota ham comes from the pig’s hind leg. It is hung and cured for at least two years, complete with the pata negra, or black hoof. 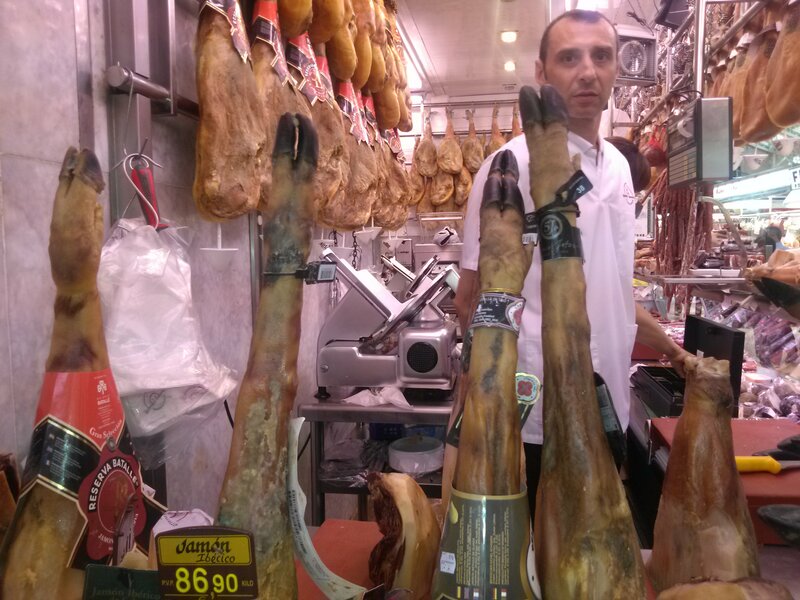 The black hoof distinguishes Iberico de Bellota from other hams, like Serrano. It has only been sold in the U.S. since 2008, sin pata negra (without black hoof). 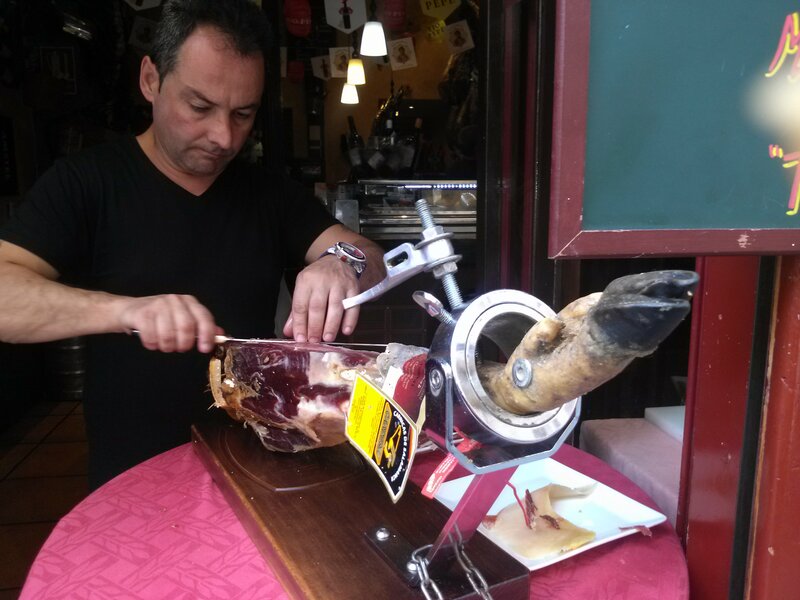 Carving slices of jamon Iberico de bellota outside a tapas bar in Madrid. Now, about the ham and its taste… The color is more magenta than pink, like the typical American ham. The meat is nicely marbled with fat. I rolled it around in my mouth before chewing and experienced an almost buttery texture. Instead of cutting away the fat, I ate it. As for the taste? It was sublime. My first taste of Jamon Iberico de Bellota was before I went to Spain. 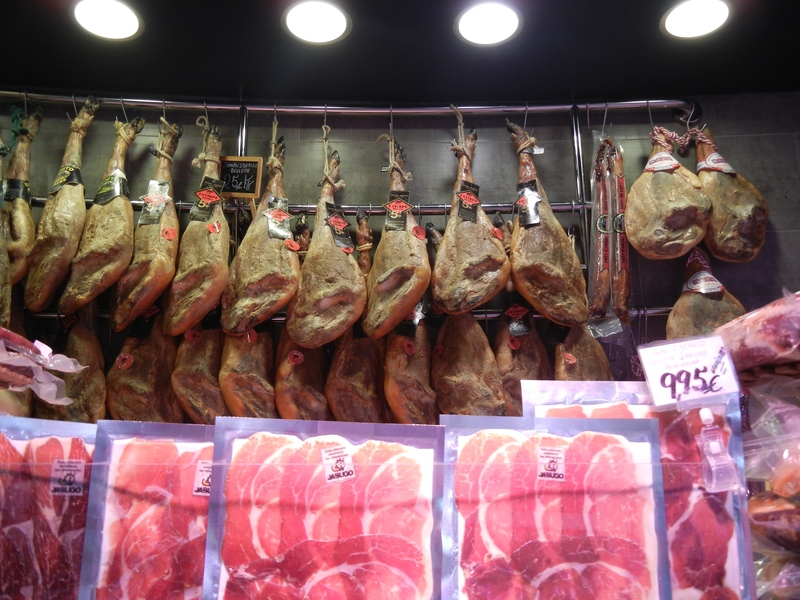 Madrid’s gastronomy is very pork-centric; so I was happy to know I could experience that part of Spanish cuisine, and easily find the ham there. From what I could tell, it is the most expensive ham in Spain, though it is still much cheaper there than here in the U.S. It is so precious, in fact, that a native of Madrid, now living in Baltimore, has a guy in Madrid who vacuum-packs his Jamon Iberico de Bellota so he can stuff as much of it as he can inside the clothes he packs in his suitcase when he returns to the U.S.
By the end of my travels in Spain, I *got* it. This pork is special. It is the only brand I will eat, although sparingly, and on rare occasions. The exception was my last night in Madrid: I was the happy pig. 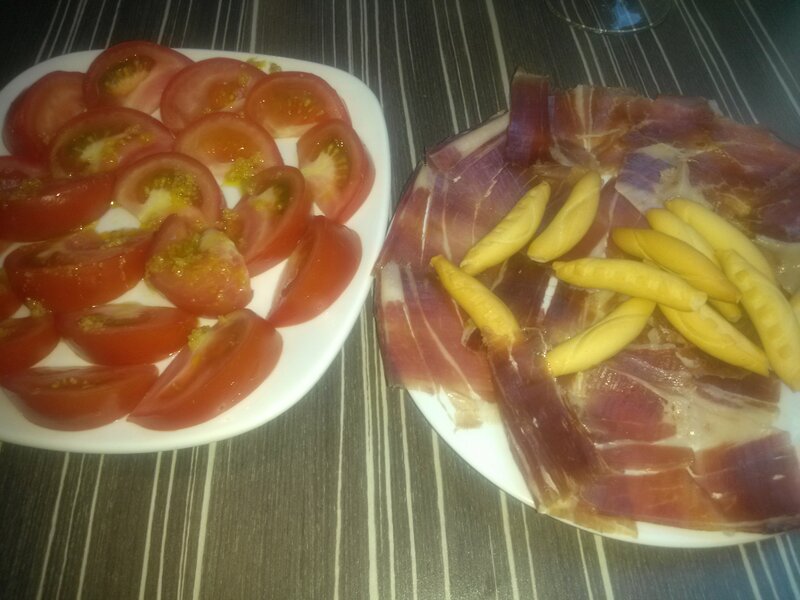 I tore up a plate of tomatoes and a plate of Jamon Iberico de Bellota meant for two to share! This entry was posted in FOOD NEWS and tagged acorns, ham, Iberico de Bellota, pigs, Spain. Bookmark the permalink. This still one of my favorites. There are a couple of punctuations issues. Call me about them. Good pictures, too! Have you proofread your comment? You’ve got some nerve, Sis…but I’ll call you. I really enjoyed reading your life experiences and travel blog. Thank you, Phil! Were you surprised to see how much of that pork I actually ate? ?